The 3,200m2 Ku.Be House of Culture and Movement was designed for the municipality of Frederiksberg as a focal point for both the immediate community and also the wider area of Copenhagen; one that the people themselves could take ownership of and that would evolve its programme based on the specific wants and needs of its users. The project is a new typology, developed out of the response to a brief that solely asked for a building that would bring people together and improve the quality of life. 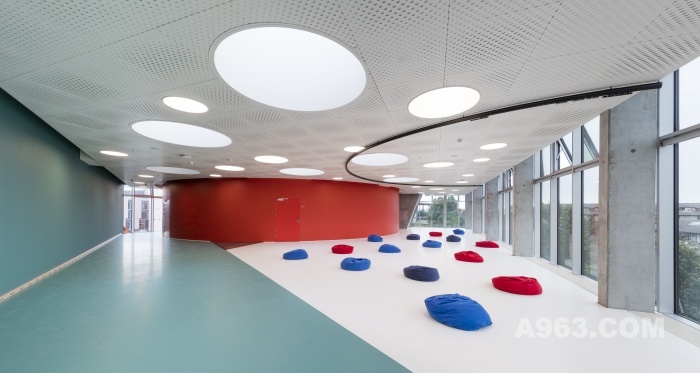 In reply, MVRDV and ADEPT answered with one that blends theater, sport and learning into a space where body and mind are activated to promote a more healthy life for everyone, regardless of age, ability or interest; creating links between people that wouldn’t otherwise connect with each other. 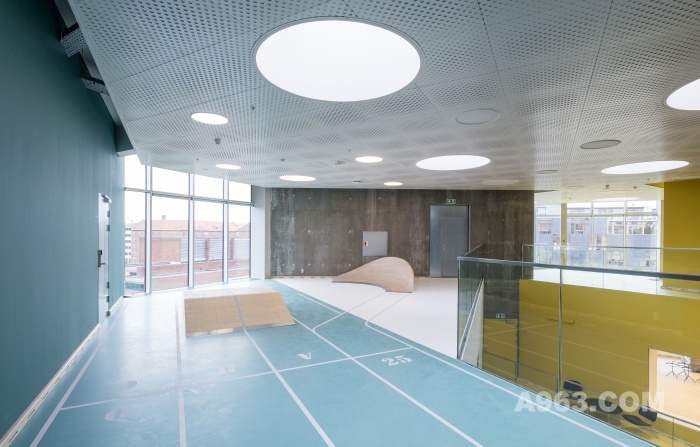 The route through the building focuses on developing and encouraging alternate forms of movement. 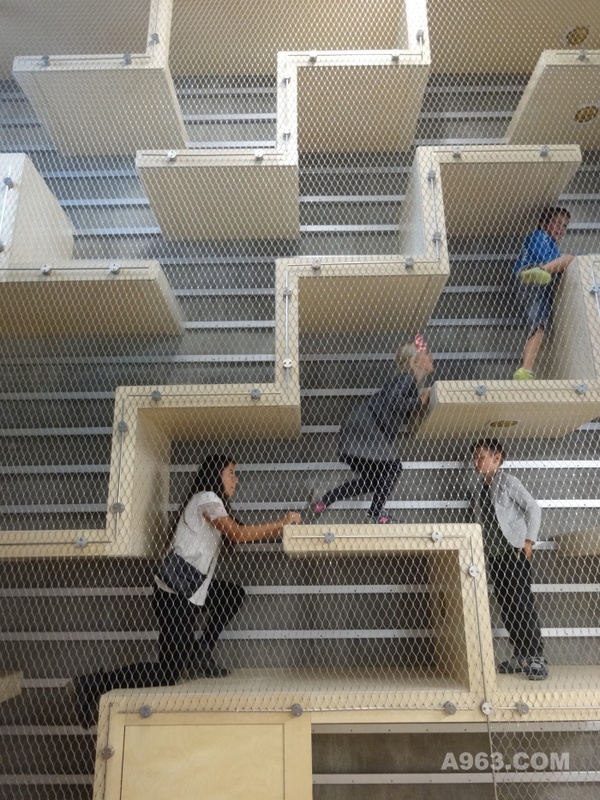 The Labyrinth gets people on their hands and knees climbing through a three-dimensional network of cubes from the second to third floors; or alternatively, they could take the Mousetrap, a vertical maze. 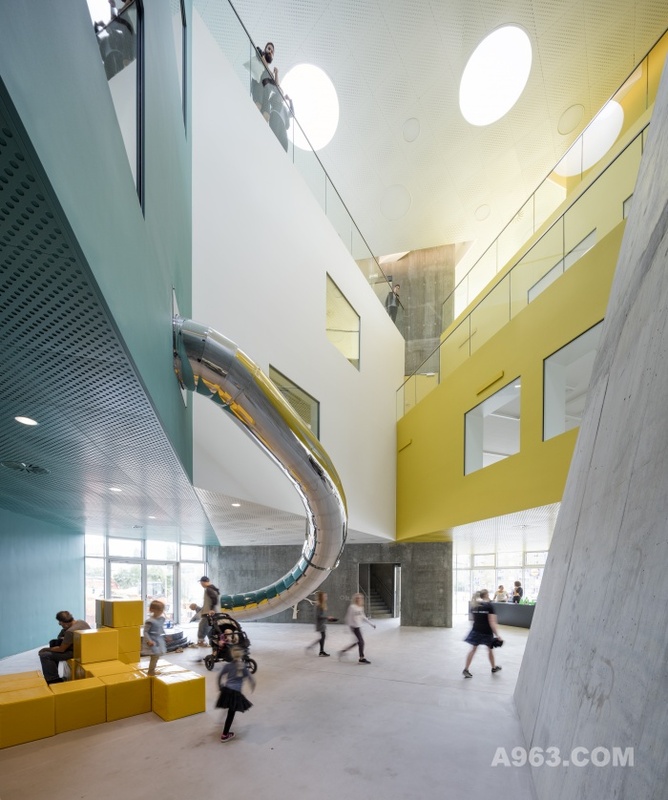 A net which spans several floors throughout the building, lets users climb up from floor to floor – suspended over the voids – and slides and fireman poles offer a fast way to get back down. 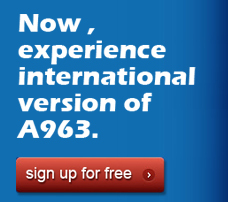 “In Ku.Be we tried to turn your average experience of a building on its head,” tells ADEPT co-founder, Martin Krogh. “What would otherwise be a simple, mindless journey through the building turns into an exploration and discovery of movement. 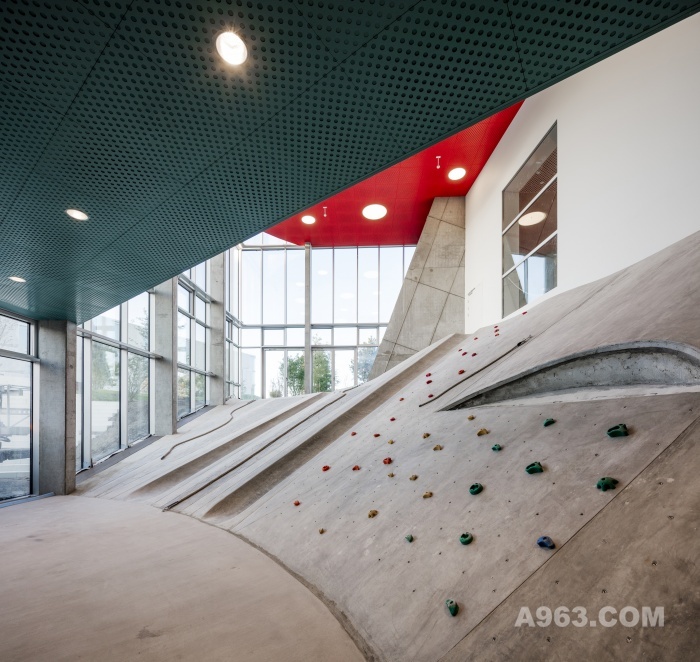 Here it’s you that defines the route, however, you want: climbing, sliding, crawling … jumping.” To cater for all abilities and ages, both easier and more standard ways of moving around are provided but even then a visual connection is maintained throughout Ku.Be. 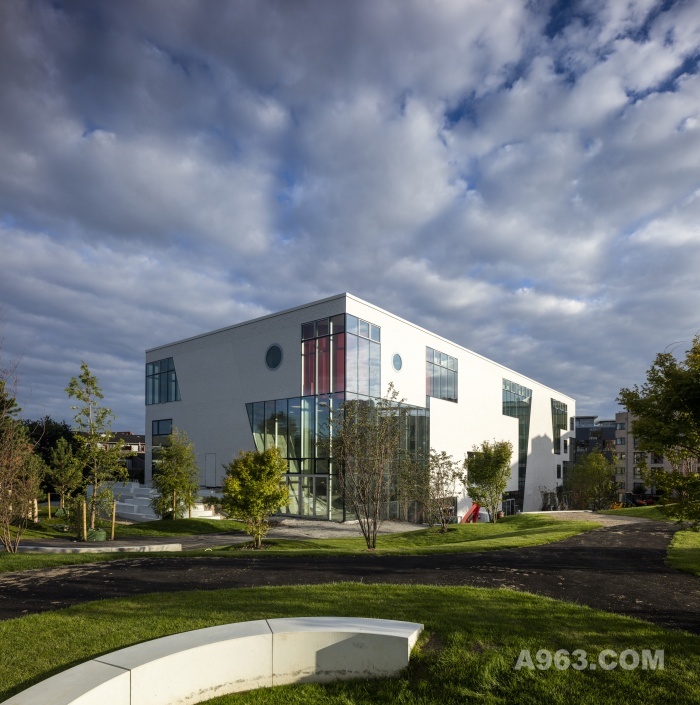 The urban gardens outside form the connection between Ku.Be and the urban realm, playing an important role in expressing the eight volumes and the activities happening inside. The diverse landscape - a system of microclimates with changing sounds, lights, and scents which blend seamlessly into a hill with integrated slides - reaches out into the gardens and ends in an amphitheater outside. 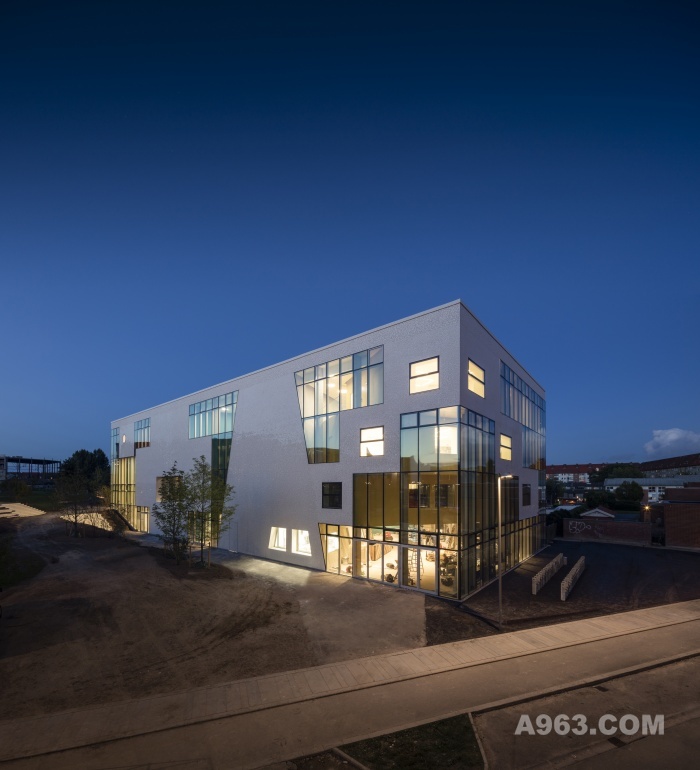 By becoming an extension of the urban landscape of Frederiksberg and integrating the community to such an extent, the House of Culture and Movement looks to become an incubator for further development within the neighborhood.